The feast of the birth of Christ is one of the greatest feasts celebrated by millions of Christians around the world and particularly in Iraq. 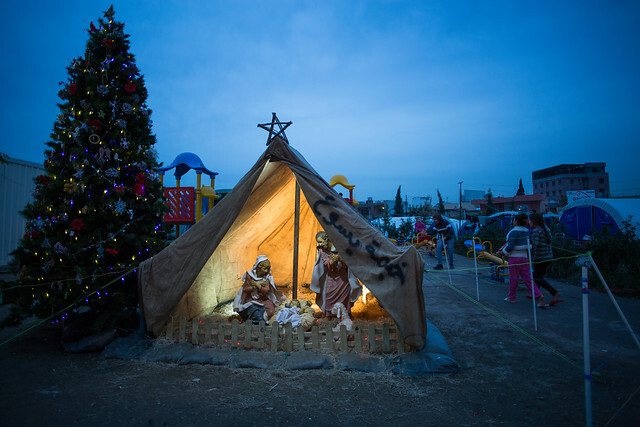 But this year Iraqi Christians will celebrate Christmas in deplorable circumstances, one the one hand because of the deteriorating condition of the situation of our country at all levels, and, on the other hand, because of what they have gone through as Christians, victims of segregation and exclusion. On this occasion, we want to be very frank again: we will not give in to injustice. On the contrary, we will remain attached to our land, and to our patriotism and we will continue to show love for our fellow citizens, simply because they are our brothers and sisters. Here we are, for a fifth year now, celebrating the Feast of the Nativity as bombs are raining down. I do not know how many of you have lived through such a depressing and sad experience, but I can assure you it is painful these beautiful days, so ardently awaited each year, amidst shortages and lack of security, or electricity and, to top things off, cut off from the rest of the world by a strict and very tight boycott. It gives me still more reason to step out from these confines, if only for a few moments, to draw in some fresh and pleasant air in writing you these words from the heart, invested with all the affection I have for you! May Almighty God have pity on all of us and he may cause friendship to reign among men, mercy in our hearts and peace among all the peoples on earth. The name of the first of three new Maronite churches in Damascus is Church of the Blessed Masabky Brothers, who were martyred in 1860. The church will be consecrated in Kachkoul, an eastern suburb of Damascus, on Jan. 8, 2015. In the middle of destruction this new chapel appears like the Star of the magi which leads to the Divine Child. It is a true Christmas present, an oasis of prayer and a sign of joy and of hope in the middle of a world of violence, of intolerance, anguish, fear and death. To build a Church in times of war and desolation expresses the will to overcome death and the courage of living the faith. Our modest faithful choose to row against the current and to renew their confidence in Jesus Christ in this dark night. This year Christmas in Damascus merges with the Resurrection.